Rosacea can cause physical and emotional harm. Whether it’s pimples and breakouts, or redness and irritation, patients suffer from many symptoms that may wax and wane and get worse over time. But there is hope. Listed below are the top 5 ways to manage rosace based on my experience of treating thousands of patients with this condition. Many patients get worse with certain triggers. These include hot beverages, spicy foods, sun exposure, heat, citrus fruits, tomatoes, stress, and anxiety. While not all these may cause problems in all patients, paying attention to what may trigger your rosacea is important. Skin care is very important in rosacea patients. I often recommend avoiding hard products, such as facial scrubs, that may irritate your skin. Instead, use products that are gentle and mild that soothe and protect your skin. I mild soap and moisturizer is a must. Several companies make topical products specifically with rosacea patients in mind. These include La Roche-Posay and Eucerin, among others. Try each product and find out what works for your skin type. And I mean EVERY DAY! Whether is summer or winter, it’s important to use sunscreen daily. UV is one of the most common triggers of rosacea. For some patients, it doesn’t take a lot of exposure to cause a flare. A simple moisturizer with sunscreen, such as CeraVe AM, should be applied every morning. It should be the first thing you put on your skin. Makeup and other products can be applied over top. Many treatments are available for the acne rosacea component. These range from topical creams and lotions, to oral antibiotic, and procedures which your dermatologist can do in the office. One of my favorite procedures for pimples of rosacea is called Blue Light (PDT). This procedure is done in the office with little to no downtime. Most patients experience mild redness for a day or two and after that recover nicely. The procedure itself is virtually painless. Packages that combine BLU-U treatment with traditional PDT are usually used. Many patients complain that redness is the most bothersome symptom of rosacea. This has two components – diffuse redness and dilated (telangiectatic) blood vessels. One of the easiest ways to treat this symptom is to cover it with makeup. I recommend green tinted makeup to patients all the time. But this is simply a cover up, it’s not addressing the underlying problem. 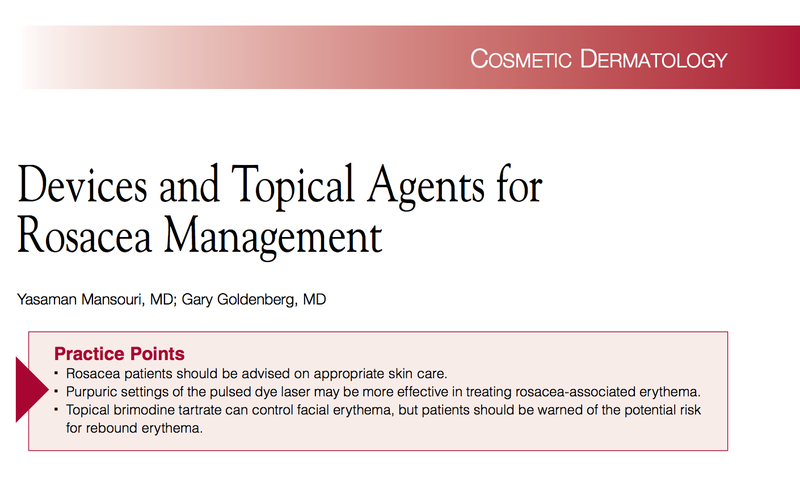 One topical agent is already FDA approved to treatment redness and another one should be coming in the next year or so. My experience with the topical products is that they make redness worse in over 10% of patients. So caution is advised. My favorite way to treat with redness of rosacea is with V-Beam Laser. This is a simple and virtually painless procedure and most patients improve. What are the skin care secrets of Oscar nominees?